A mobile thella housing a rusty stove, an aluminium pan, ingredients to make chai and glass jars filled with an odd namkeens or rusks… from love stories to creative AD campaigns, college gossip sessions to discussions over the unfair boss and midnight hostel birthday treats to philosophies on life… the chai ki dukaan has seen it all! It is indeed the ‘vehicle’ we have all travelled ‘with’. Today, India is one of the largest tea producers in the world. Chai has been our major global contribution. What’s more, a phenomenal 70% of output is consumed within the country. From its 18th century medicinal use, tea has journeyed a long way, becoming integral to our lives. Tea plantations were started by the British in the 1830s mainly for export to the UK. Tea culture as we know it today didn’t exist until the early 1900s when British tea associations made efforts to popularise it in India, giving rise to the great chai stall.The tea associations started their campaign by setting up stalls in various cities. They encouraged tea plantation employees, then workers almost everywhere else – in factories andhuge households-to take tea breaks. The railways brought more stalls, which gained in popularity as the beverage did. And voila! Chai stalls flourished and tea became ‘the’ drink.Credit for introducing milk and sugar also goes to the British who had an aversion to tea’s slightly bitter taste. They likewise sweetened cocoa, impacting chocolate: that, too, began as a bitter product. This, my friends, is the story of our humble tea stalls, and Ibet my hard earned money that you’ve all had an affair with one, knowingly or otherwise, during your college and work years. 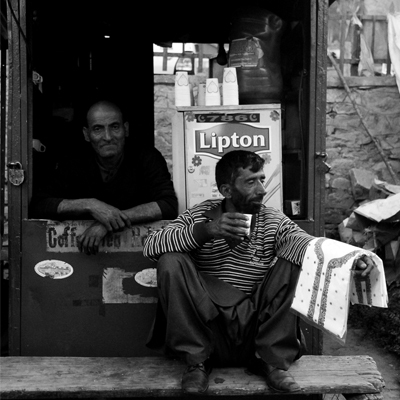 Today no work area or office building worth its salt exists without a tea vendor nearby. The mobile ‘thella’, though becoming a thing of the past, is what first springs to mind when one pictures a stall. These rickety wooden vehicles generally housed a stove, an aluminium pan and the ingredients required for making tea, including cardamom, cloves and cinnamon. Masala chai…ahh… the aroma! Other accompaniments might be found on the moving carts, adding extra temptation: shiny glass jars filled with macaroons, atta cookies,mathri, and the odd namkeen. Thellas have given way to concrete structures. Ask any hip college gang or the most agileoffice workers:the chai stall – sacrosanct space – is elementary to their existence and the birth of big ideas.I often think that many stalls must have witnessed revolutions taking shape. Others would relate, if they could, love stories that would leave you mushy inside like buttered toast dipped in hot tea.Avid travellerssuch as bikers might tell you tales of chai stall hospitality or the warm feeling of holding a glass of hot tea bought from a vendor doing rounds with his ketli. I’ve bonded closely with two stalls at different times in my life. These fond associations, tied to memories of friendship and struggle, stem from the fact that I was miles away from the comforts of home and family. The stalls became literal sourcesof my bread and butter, as well as venues for memorable conversations, deep philosophical discussions and the exchange of precious dreams. One, of course, was part of the college canteen at GCG (Government College for Girls), Sector 11 in Chandigarh, where a modest white tea cup could fetch you warmth and comfort for a mere Rs 2. I would sit, spin poems and visualise the life awaiting me. The other was located in a quaint gully in New Delhi’s Gole Market. A toothless man owned the place. Here, good chat, advice and delicious buttered buns were always available. Three of us, friends, starting out in the TV industry would make our way to the stall at day’s end to talk shoots, schedules and office gossip. Some would say that chai stalls have been usurped by vending machines but I would argue that chai stall charm remains unbeatable. Anyone addicted to the culture would hardly ever convert to modern machinery. Chai stalls remain inseparable from the days and times of our lives. Keep blowing the Trumpet! This & many more stories await in our pages!